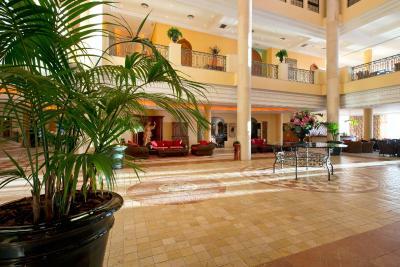 Lock in a great price for Hotel IPV Palace & Spa - Adults Recommended – rated 8.8 by recent guests! It is right on the beach and next to the highway so easy access. Nice patio table and chairs to enjoy the views. The breakfast buffet was outstanding, and the staff was helpful and friendly. 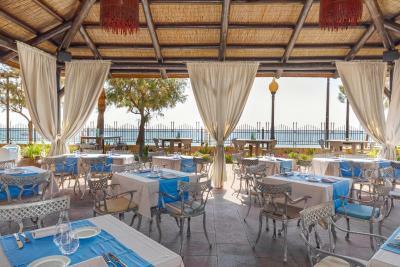 Relaxing and comfortable hotel with great sea views and good food. It's our second time in this hotel.. Very clean property, excellent location next to the beach and few minutes away from downtown, excellent food, very clean swimming pool and garden, very professional staff at all levels, a special thank you to CARLO for his kindness and professionalism for making the kids & us enjoy our stay to the fullest (by the way the kids loved the t-shirts;)) would definitely come back !! 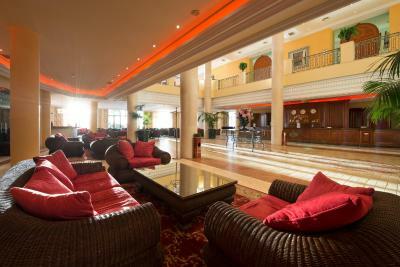 The hotel is comfortable and clean, the staff friendly with very good English spoken. Plenty of sun loungers around a decent sized pool. The room was a good size with a large bathroom and was very clean. Large menu available in the restaurant, though it can get rather busy. We didn't get a chance to use the spa facilities as we were only there for two nights, but they looked good. The overall property is excellent. However, the individual room I had was marginal. The location was perfect. 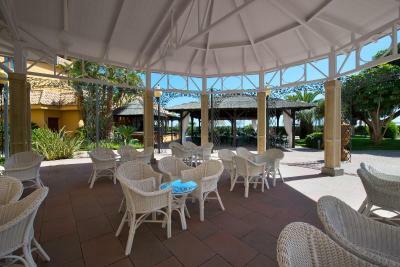 Right on the beach and a clean fairly updated hotel with a nice pool overlooking ocean. Activities for the children etc. We enjoyed the world cup games on the projection TV under the outdoor covered patio area. Was fun to be in Spain when Spain was playing and winning. Staff were super friendly, clean facilities, nice pool, far enough away from the hub bub to be quiet at night but close enough to walk to cafes and restaurants. Had a suite was nice size comfortable bed. Great view. Only included breakfast on my plan buffet was about average to other hotels. Location was very good close enough to walk into town and on the beach. Great underground parking but must reserve. Hotel staff were very friendly and helpful especially spa attendant she helped me find Donny’s Bar when asked for a place to have steaks. Front desk attendant was also very helpful. 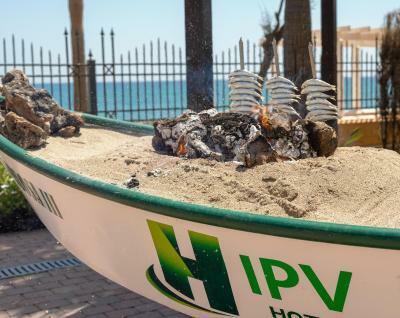 Hotel IPV Palace & Spa - Adults Recommended This rating is a reflection of how the property compares to the industry standard when it comes to price, facilities and services available. It's based on a self-evaluation by the property. Use this rating to help choose your stay! 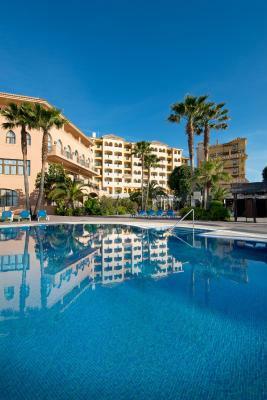 One of our top picks in Fuengirola.Located on Fuengirola beachfront, next to the 12th-century Sohail Castle, this hotel has 2 swimming pools and a spa. 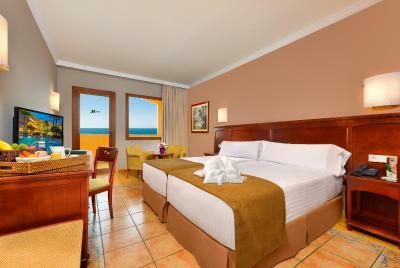 The bright and spacious rooms at Hotel IPV Palace & Spa - Adults Recommended feature free WiFi and a private terrace. 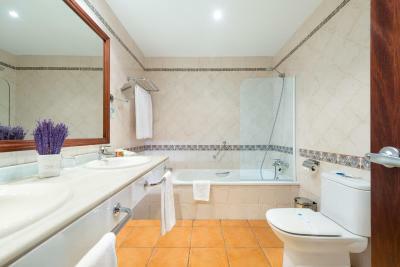 Each room has a mini-bar and a flat-screen satellite TV with international channels. 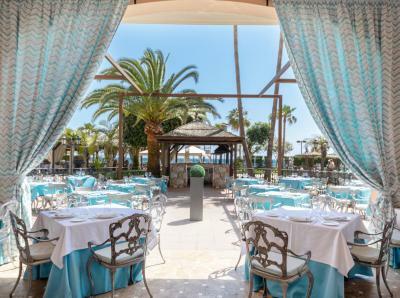 The complex has 4 restaurants, including La Alacena, which opens in the winter months and combines traditional and modern cuisine. Specialties include rice, fish, meat and game. The Doña Lola restaurant offers buffet cuisine, including show cooking. 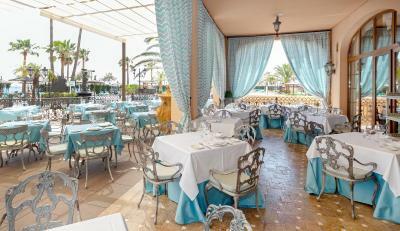 The Beach Club Restaurant is set by the pool and open during the summer season. Tapas are served at the La Taurina bar and there is also a piano bar, open during the winter months. 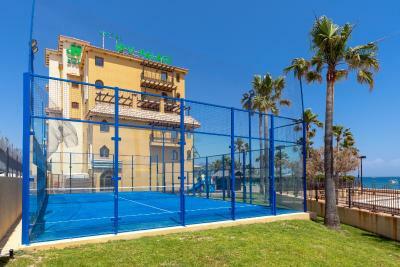 Entertainment for children and adults is provided in summer months, including aqua-gym and yoga classes. You can consult timetables once at the hotel. 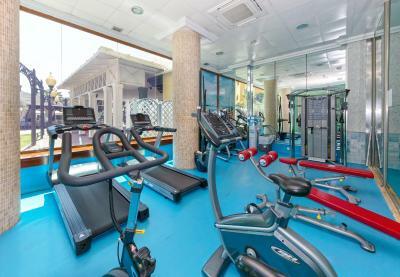 There is a fitness center open for all guests for free, the Spa is available for a surcharge. 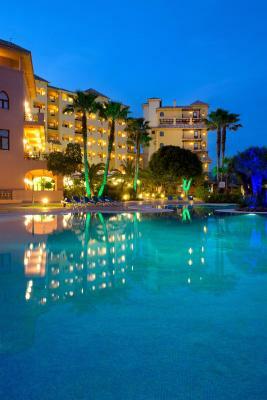 Hotel IPV Palace & Spa - Adults Recommended is a 15-minute walk from central Fuengirola. Málaga Airport is around 12 mi away. 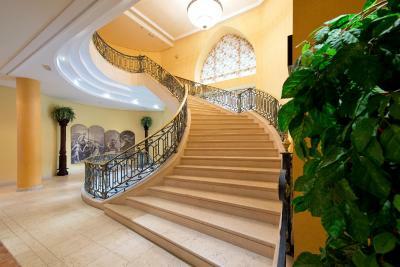 When would you like to stay at Hotel IPV Palace & Spa - Adults Recommended? Please note that this room is made up of 2 adjoining double or twin rooms. Offering a terrace with sea views, these air-conditioned rooms include a flat-screen satellite TV, free Wi-Fi, a minibar and a safe. The safe is available for an extra charge. Offering a terrace with sea views, this air-conditioned room includes a flat-screen satellite TV, free WiFi, a mini-bar and a safe. 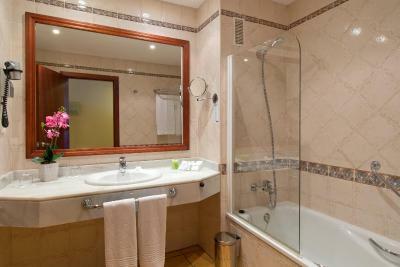 The bathroom comes with a bath or a shower, subject to availability. 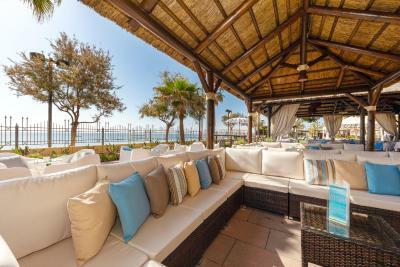 This air-conditioned suite with a balcony or terrace offering views of the Mediterranean sea. 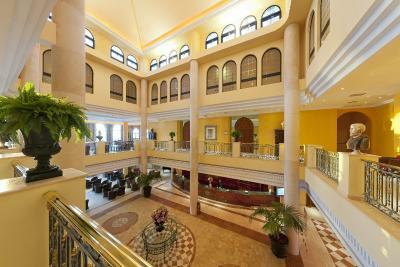 It includes free Wi-Fi, a flat-screen satellite TV, minibar and safe. The safe is available for an extra fee. Please note that cribs are not available for this room. This suite includes 1 free spa experience per person, and a welcome package. Private parking is also free, subject to availability. 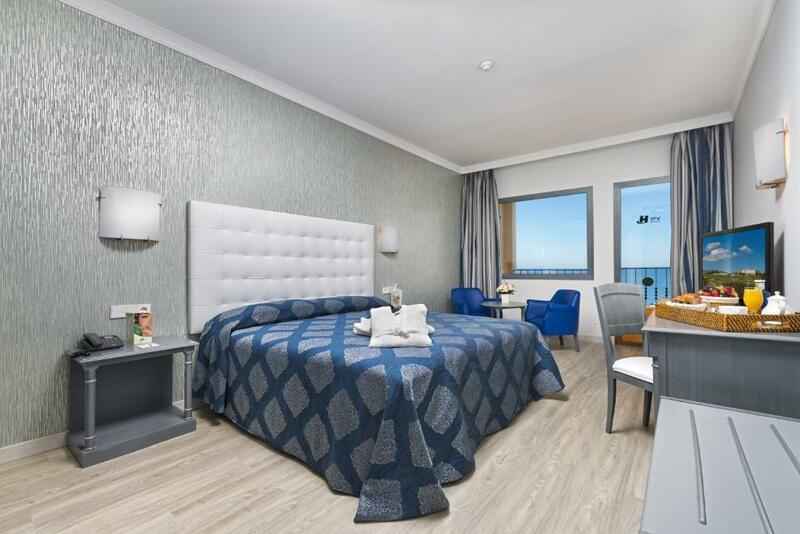 Made up of 2 bedrooms, 2 bathrooms and a living room, this air-conditioned suite offers a balcony or terrace with views of the Mediterranean sea. 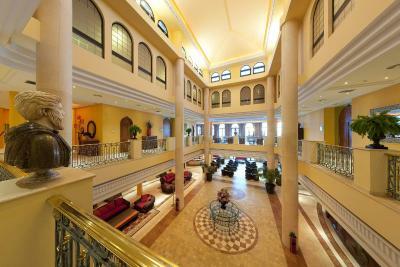 It includes free Wi-Fi, a flat-screen satellite TV, minibar and safe. Everything at our charming, unique hotel is different. 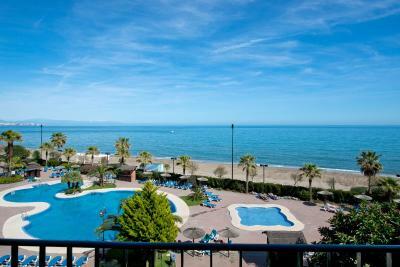 It enjoys an excellent location and is 300 metres of the beach, which is practically exclusive to guests. Just 20 minutes away from the airport, a few kilometres away from Marbella and bordering Mijas, our building is iconic for its original design. 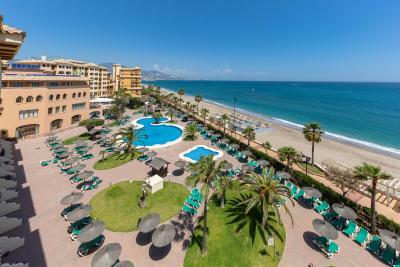 Hotel IPV Palace & Spa is a new, luxury concept in a wonderful setting in the heart of the Costa del Sol. 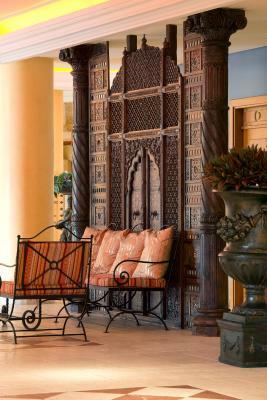 House Rules Hotel IPV Palace & Spa - Adults Recommended takes special requests – add in the next step! Hotel IPV Palace &amp; Spa - Adults Recommended accepts these cards and reserves the right to temporarily hold an amount prior to arrival. Hotel IPV Palace & Spa - Adults Recommended accepts these cards and reserves the right to temporarily hold an amount prior to arrival. Please note spa facilities are available for a surcharge. Spa treatments must be booked in advance and are subject to availability. Please note the following opening hours for the gym and spa, are: Tuesday-Saturday: From 10:00 to 20:00 Sunday and Monday: From 10:00 to 14:00. A safe is available in each room for an extra charge. Access to the spa is restricted to guests aged over 16. Please note that gentlemen must wear long trousers at dinner. Please note that air conditioning and heating in rooms are not individually controlled. The published half-board and full-board rates for stays on the 24 and 31 December include a mandatory fee for the gala dinners held on those evenings. - Brunch Buffet till 15:00 pm. Nothing. It was all fantastic. Everything. Great food and facilities. 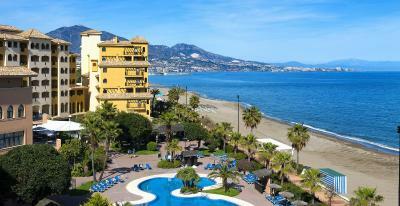 Very good location with all bedrooms beach facing. Our room was large, clean and modern with a comfortable bed. Easy free parking for the car. Staff excellent. We would be very happy to return to this hotel. 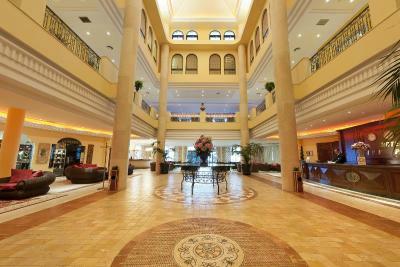 The location and the facilities are great and it is especially the friendly staff and the customer service attitude of the hotel that makes us go back time and time again. The staff goes out of their way to make your feel welcome and are always ready to assist with any queries or wishes you may have. 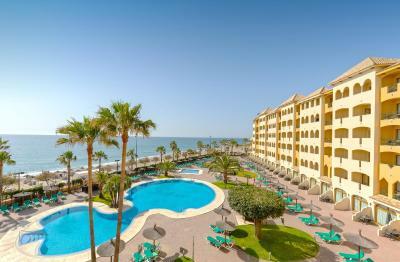 This was our fourth visit to the hotel and it confirmed, once again, that this is the hotel for us on Costa del Sol. 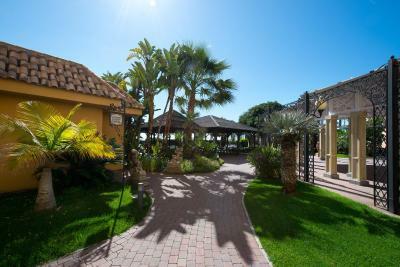 There is free parking at the hotel and it is lovely to return to your home base after a day of golfing or trips to nearby sights not having to worry where to eat or drink, be it tapas, drinks or dinner. The food is excellent; plentiful breakfast and buffet dinner and you may also choose the a la carte restaurant or tapas bar. We can highly recommend IPV Spa for an enjoyable holiday experience. We love the ipv. 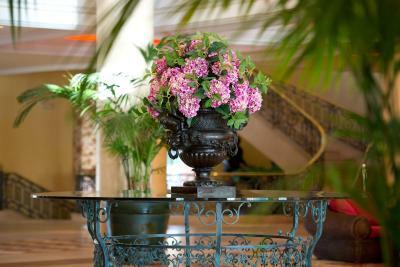 It is such a wonderful hotel and such amazing value. The breakfast is lovely and everything is so clean. Our adjoining rooms were fabulous with a wonderful view of the sea. We will definitely be back. Fantastic breakfast and personnel. Will be back. They charge extra for use of the indoor swimming pool. It also says Adults recommended but was full of children so this is obviously misleading.